Below are listed some interesting audio clips, podcasts and radio programmes that explain crystallography. Click on the image to download an audio file, listen to the clip, or be directed to an external website. 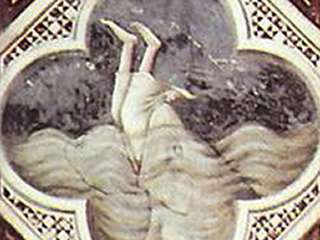 Click on the smaller images for more information. ATOMIC radio is a six-part radio series bringing stories from the long relationship between the arts and the science of X-ray crystallography, featuring conversations with artists, designers and scientists, new writing and original sound artworks. X-ray crystallography, which is celebrating its 100th anniversary, is a science that reveals the invisible, the tiny atomic structures of molecules and crystals – and it has been quietly influencing art and design for decades. Each episode spotlights a different piece of art or design prompted by the science of atoms, featuring interviews with the designer Alexandra Daisy Ginsberg, artist Conrad Shawcross, science writer Georgina Ferry, the X-ray crystallographer Stephen Curry and many more. ATOMIC radio is a part of the Resonance 104.4 FM Science Museum residency and part of the 2014 International Year of Crystallography. It is supported by the Science Museum Art Programme. It was first broadcast live on Fridays at 4.30pm GMT beginning the 23rd of May on Resonance 104.4 FM and online. The series is part of Emily Candela‘s AHRC Collaborative Doctoral Award research between the Royal College of Art and the Science Museum and it was made by Emily Candela, Chris Dixon, Emmett Glynn and Sam Conran. Today the borders between the arts and sciences are becoming more porous. Some artists and designers are even leaving behind their studios for laboratories where they are collaborating with scientists. In this episode we venture into the mysterious borderland between these two worlds, encountering the techniques used by crystallographers to shed light on the invisible structures of matter – techniques which have inspired designers and artists for decades. In this episode Emily Candela visits the X-ray crystallographer Stephen Curry at his Imperial College lab, and speaks with the glass artist Shelley James – one of those artists who has entered the lab – about her collaboration with King's College London X-ray crystallographer Brian Sutton. See more of the works that have come out of their collaboration on the ATOMIC radio website. Shelley James’ work will be on show at the summer 2014 Jerwood Makers exhibition, opening on the 11th of July. In this episode we look in on the love affair between the science of atoms and fiction – from crystallographers' most inventive models of the invisible sub-microscopic world to the atomic dramas chronicled in artist Tacita Dean's film The Structure of Ice. We hear from Science Museum curator Boris Jardin, an expert not only on crystallography models but also on the relationship between art and science, and Emily Candela reflects on the place of imaginative speculation in science and the arts with Alexandra Daisy Ginsberg, an artist and designer who makes a career of walking the line between science and fiction. 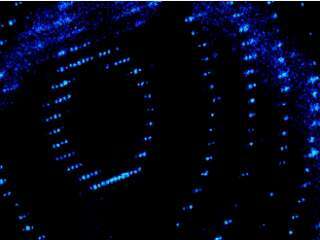 X-ray crystallographers make the invisible structures of atoms in matter visible. But in order to do so, they must transform their subject matter into a nearly indecipherable code – this is the process of X-ray diffraction. 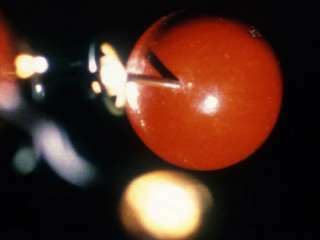 Diffraction, from the Latin for ‘to break into pieces’, is central to a crystallographer’s process of translating from the invisible to the visible. To access the internal structure of a crystal, crystallographers shoot a beam of X-rays through it, and when they hit the atoms inside, these X-rays diffract: they split apart and spread out before reaching a photographic detector on the other side. This episode explores the ways in which breaking something into pieces can help to understand it, from the story of crystallographer Rosalind Franklin’s X-ray diffraction photograph that revealed the DNA double helix, to artist and academic Lina Hakim on what breaking toys apart has in common with crystallography, and the work of composer Margaret Schedel who is experimenting with new ways for scientists to understand X-ray data more deeply – by using their ears. 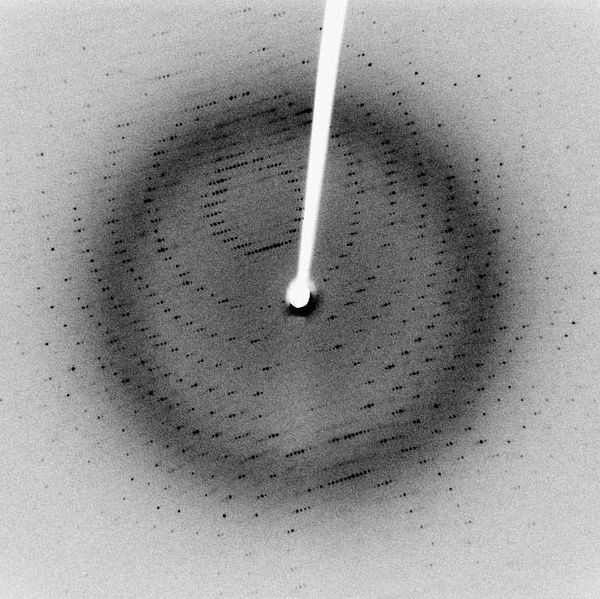 When X-ray crystallographers pass a beam of X-rays through a crystal, these X-rays leave a pattern on the other side, creating a diffraction photograph like this one. 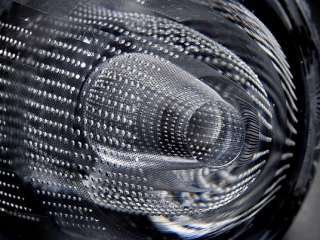 In this episode, you’ll hear sound designer Sam Conran translation of this diffraction photograph – as well as a diffraction photo of quasicrystals – into sound. Episode 4: A 'Women's Science'? 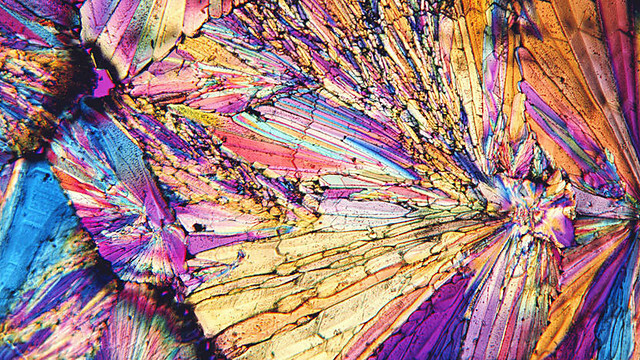 X-ray crystallography has long had a reputation for being a scientific field with a significant number of female practitioners, especially in the first half of the twentieth century when it was rare to find women in any scientific discipline. This episode looks at how ideas of 'women's work' did – and did not – affect the lives of crystallography’s pioneering female scientists, with the help of our guest this week, science writer Georgina Ferry, whose writing is re-framing the issue of women in crystallography. 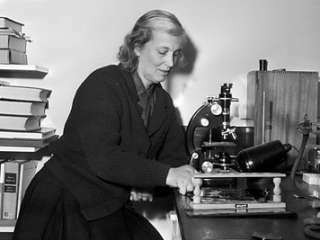 We take a peek into the life of X-ray crystallographer Dorothy Hodgkin, who in 1964 became the only British woman ever to win a science Nobel Prize. 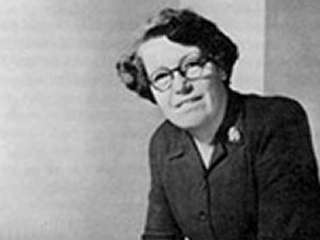 Then we spotlight the work, across science and design, of the X-ray crystallographer Helen Megaw (pictured) who spearheaded the Festival Pattern Group, which created spectacular patterns for household goods based on crystal diagrams all the way back in the 1950s. This episode is broadcast from inside a molecule of a sperm whale’s myoglobin, a protein in muscle tissue (to find out what we mean by that, you’ll have to listen to this episode!). We'll learn about dramatically magnified molecules – specifically, about molecular forms that have been translated into architectures that dwarf the human body. We’ll hear from cultural historian Celeste Olalquiaga on the ruin of a helical mall in Caracas, Venezuela, and the historian of science Soraya de Chadarevian, who will illuminate the fantastical molecular forms broadcast on television during the Cold War. For this week’s show we’ve also created our own molecular architecture – one perceivable only through sound. It’s a virtual reverb space build by ATOMIC radio sound designer Sam Conran, inspired by a model of a molecule of a sperm whale’s myoglobin, a protein found in the whale’s muscle tissue. Inside this myoglobin molecule we’ll hear a new radio play written just for this molecular sound space by the writer Daniel Marrone, performed by Janina Lange and Edwina Attlee. 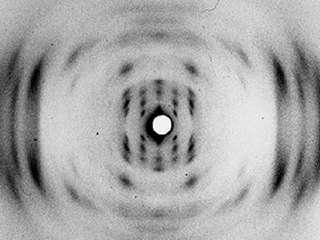 Find out more about myoglobin, the first protein structure discovered by X-ray crystallographers, here and at the Protein Data Bank, an enormous archive of the atomic structures of every protein scientists have mapped that was also a vital source for the sound space we made for this episode. X-ray crystallography has the power to reveal the most fundamental structures of matter, but there is a lot that the science can’t see. This episode explores the ways in which crystallography – and much art – traffics in shadows and blind spots. 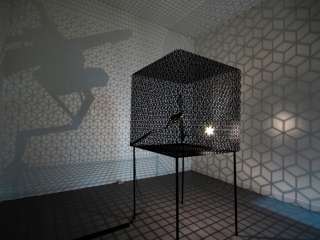 We feature a sculpture partially composed of light by the artist Conrad Shawcross and and hear from the artist about the crystallographer who inspired his piece. 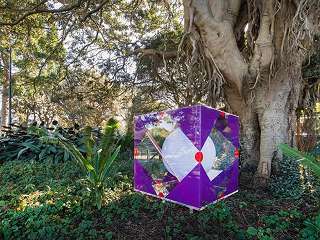 And in honour of X-ray crystallographers’ explorations of the structures of nature, we close the ATOMIC radioseries by discerning some structures for ourselves. The journalist and founder of super/collider, Chris Hatherill joins Emily in the studio to share his five favourite structures from nature. Chris shines new light on deceptively simple structures like the snowflake and takes us to the cutting edge of current scientific mysteries. Professor Elspeth Garman commemorates a century since the publication of an idea that made discovering protein structures possible: The Bragg Equation. 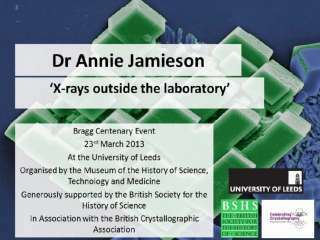 She takes us from the Braggs' father-and-son discovery of x-ray crystallography and publication of the structure of table salt in 1913, to the cutting-edge work happening in her lab at Oxford University. 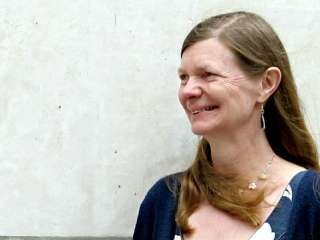 Her team's past projects have included determining the structure of the N9 part of influenza viruses, which was used to develop antiviral drugs. She explains how this work and cryogenically cooling proteins to preserve them inside the Diamond Light Source synchrotron are where crystallography is heading. 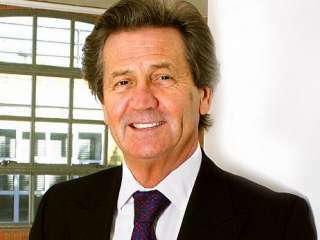 Quentin Cooper discusses these ideas with Professor Garman as part of BBC Radio 4's programme Material World, which makes a road trip to the 2013 Science Festival at Cheltenham. To mark the 50th anniversary of the award of the Nobel Prize in Chemistry for her determinations by X-ray techniques of the structures of important biochemical substances, the BBC broadcast a portrait of Dorothy Hodgkin (1910-1994) through her correspondence. To date, Dorothy Hodgkin is the only female British scientist to have been awarded a Nobel Prize in a science discipline. The series is introduced by her biographer Georgina Ferry. From an early age, Dorothy ran the family home, looking after her younger siblings while her parents travelled the world. In 1928, her parents encouraged her to apply to Oxford University to read chemistry, confident in her intellectual ability. But her father worried that, without a good haircut, her appearance might let her down and her distant but devoted mother repeatedly warned her not to work too hard. In the early 1930s, Dorothy and her lover, J.D. Bernal were passionately committed to cracking chemical structures. Letters, both scientific and highly personal, flew back and forth between them, as hugely complex molecules competed with equally complex affairs of the heart. Undeterred by wartime and motherhood, Dorothy determined the structure of penicillin in 1945 while breastfeeding her daughter Liz. As ever, her mother urged her to go gently but, inspired by her discoveries, Dorothy worked harder than ever. By the late 1940s, Dorothy was well established as a major scientific talent. In 1947, she was elected as one of the first female fellows of the highly prestigious, Royal Society. Her fame spread around the world. And, in 1955, to great acclaim, she determined the structure of vitamin B12, a factor in pernicious anaemia. Later in life, Dorothy returned to work on insulin, a monstrously complicated molecule that, in the end, took 35 years to solve. She was also an active campaigner for peace, travelling to China and Russia during the Cold War and writing to Margaret Thatcher about nuclear disarmament and chemical weapons. In 1964, she won the Nobel Prize for Chemistry and, to this day remains the only British woman to be awarded such an honour. To celebrate the centenary of the first crystal structure determinations by X-ray diffraction, the University of Leeds hosted a day-long commemorative event on 23 March 2013, which included a number of public lectures. Many of these highlighted the influence on, and subsequent practice of, structural science at Leeds thanks to the early influence of Henry and Lawrence Bragg. These lectures are available on YouTube (mostly showing slide shows or static title cards). Kersten Hall tells how, when Sir William Henry Bragg arrived at the Royal Institution in 1923, he inspired a new generation of younger scientists to develop the science of X-ray crystallography that he and his son Lawrence had founded. 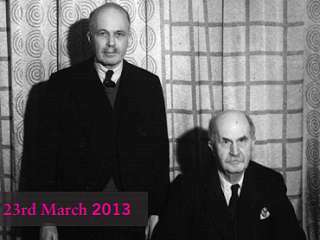 One of these was William T. Astbury who was encouraged by Bragg to begin using X-rays to explore the structure of fibres from living systems. 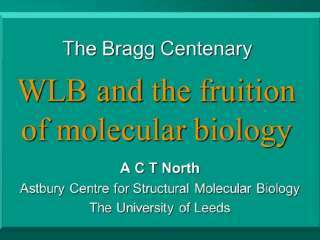 In 1928, Astbury came to Leeds to work as a textile physicist using X-rays to study the structure of wool fibres for the local woollen industry. In the course of this work however, he not only made the very first studies of the structure of DNA which would later provide James Watson and Francis Crick with a vital foothold but also popularised the new science of 'molecular biology' that would have a profound impact on the world. Part of the Bragg Centenary Event at the University of Leeds, 23 March 2013. Organised by the Museum of the History of Science, Technology and Medicine. 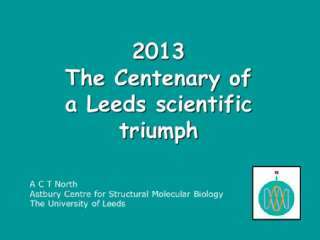 Generously supported by the British Society for the History of Science. In Association with the British Crystallographic Association.